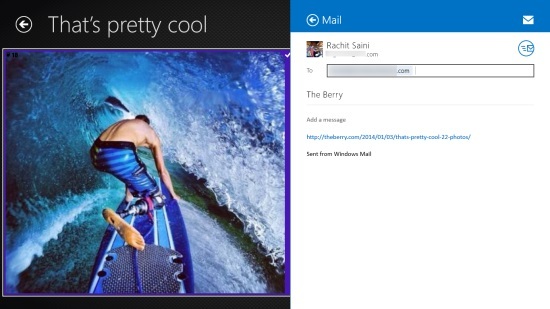 The Berry is a Windows 8 Photo App. With this app, you can access the best photos from The Berry.com, which is a well known source of funny and humorous photos floating around the Internet. You can add these photos to your favorites, and access them anytime from there. If you sign into the app, there is an option to upload the photos directly to your Skydrive account. You can also download and share these photos with others over the Internet. The Berry is freely available in the Entertainment category of Windows Store. 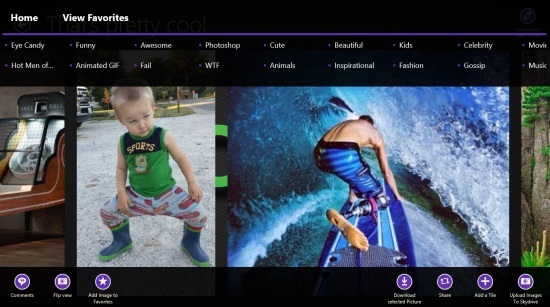 As you get to the main screen of the app, all the latest photos would be shown to you along with your favorites. You can use the upper flyout of the app to get to any particular category. Funny, Awesome, Cute, Beautiful, Kids, and many others are available here. The app also provides you with animated GIFs. You can add photos to your favorites and access them readily from the main screen itself. To add photos to your favorites, first use the activate select mode when you view photos in a particular category. As you use the option, you can select any of the photos that are available. On selecting, right click anywhere outside the photo. A bottom flyout will appear, from where you can use the add to favorite option to add this to your favorites list. You can download photos onto your local storage. The photo shall be available in .JPEG format. You can directly upload the photo to your Skydrive account. For that, you first have to sign in into the app. The app will use your Microsoft account for this. You just have to select a photo, and use the option to upload the photo to Skydrive, from the bottom flyout. You can share photos with others over the internet. For this, first select a photo. Then use the share option that is available in the bottom flyout of the app. There is an option to upload the photos directly to your Skydrive account. You can also download the photos available here. Manage favorites to access the content readily. The app is freely available in Windows Store. Also check out some free photo editing apps. The Berry is quite a nice Windows 8 Photo app to get funny, hilarious, and viral photos from the Internet The app sometimes lags a little but is worth trying. So, go ahead and explore.